Happy Saturday!!! Here in Southern Ontario it's a loooooongggggg weekend!! YAY!!! Happy Victoria Day!! 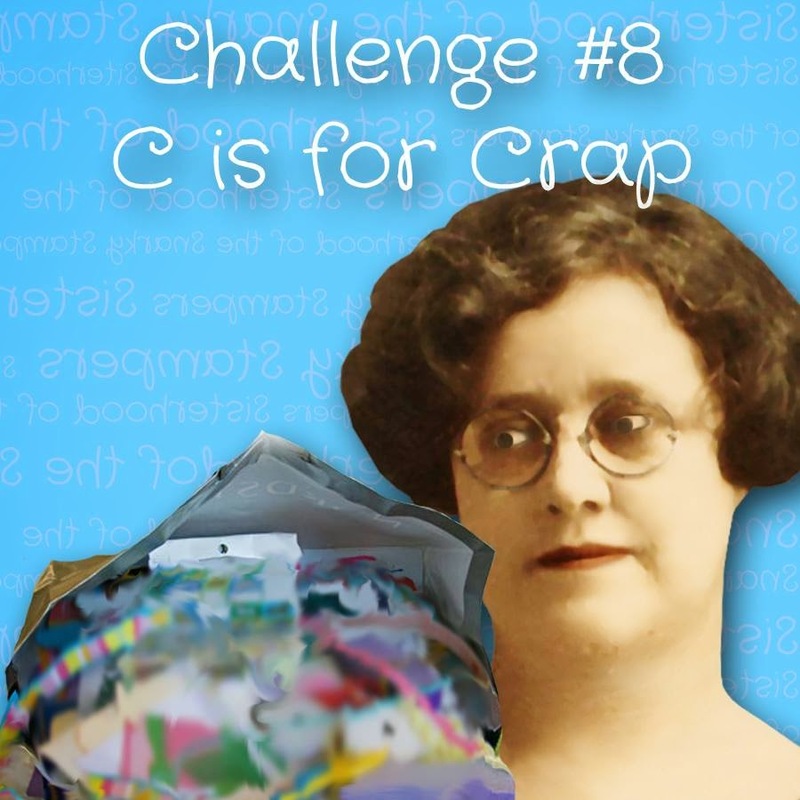 This week the sisterhood is backatchya with another fun challenge....C is for CRAP!! 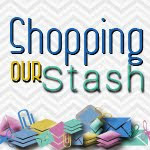 We want to see what you have in your stash that makes you think (or say out loud) "WTF??? Why did I buy that??" For me this was an easy one...I have one particular stamp set that I have owned for some time now and hasn't seen ink until this challenge...nor will it likely ever again! I am sure I was at a class or something, made something cute and then thought "I must buy that." It's no secret to anyone that knows me that I don't like birds. I don't like birds and birds don't like me, it's a mutual relationship of mistrust and dislike...so why then did I buy this BIRD stamp set??? To be fair, I do like owls, I like real owls, I like owl stamps...I think they are adorable...the rest of bird nation...not so much. On the inside of this card I think I will write "may the poop of a thousand birds bring you much luck"
Want to get in on the fun?? 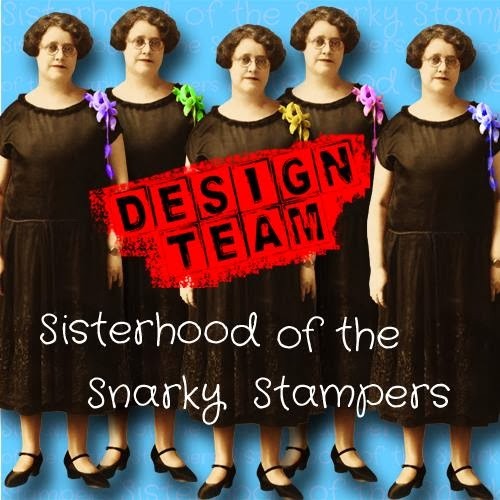 Visit the SNARKY STAMPERS BLOG and show us your best C is for CRAP project. 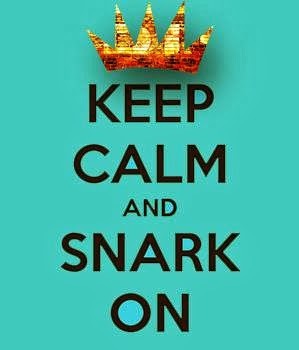 You have until 11:55 pm (EST) on Friday May 30th to upload your project...and while you are there be sure to visit the blogs of my teammies and show them some snarky crafty love. You did your crap proud! :) Love this challenge! And look! You have bird patterned paper as well! Funny how once you bring out one piece of crap, using other crap just falls into place. And yet you still ended up with this awesome card! Yeah, what Lindsey said: you even found bird DP to go with your crappy bird stamps! LOL! Way to use your crap, Donna! This card is all kinds of awesome! lol, well your "crappy" stash sure helped you churn out a cute and fun card!!! Thanks for visiting - thought I would come by and comment since we did actually have flakes of snow in the air for a short time on Friday! - it was originally forecasting 1-3 cm but thankfully that changed! I am in Thunder Bay and it was a really long winter! I love owls too and empty old fashioned birdcages. Great job with c is for crap. How can you not like birds? They sing to wake you up at 5 a.m, they poop on your freshly washed car, and they don't deal well with jet engines. 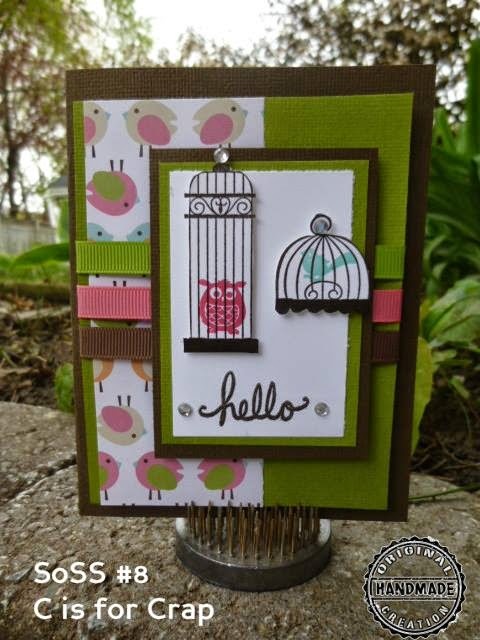 For not liking birds you have made a very cute bird card...of course they are in jail, which may be purely symbolic.. I have to say I kind of like birds - mainly because now that we're in a little place, we get fun birds to watch like chickadees & woodpeckers. Growing up with just pigeons, crows, and seagulls (or shithawks, lol) has me enjoying them. Not so much the eleventy billion starlings nesting in the carport, but hey.